BLOOMINGTON, Ind. -- Indiana University Bloomington and Indiana University-Purdue University Indianapolis, along with four regional campuses, a regional education center and a program within the Kelley School of Business, have been named 2014 Military Friendly Schools by Victory Media Inc., a veteran-owned business that publishes the annual list. In addition to IU Bloomington and IUPUI, this year’s list includes IU East, IU Northwest, IU Southeast, Indiana University-Purdue University Fort Wayne, Indiana University-Purdue University Columbus and the IU Kelley School of Business Full-Time MBA Program. 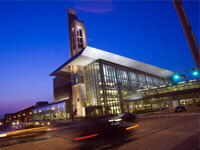 This is the first year IUPUI has been recognized with the designation. The 2014 list of Military Friendly Schools was compiled through research and a free, data-driven survey of more than 10,000 Veterans Affairs-approved schools nationwide. Survey results were independently tested by Ernst & Young LLP, based upon the weightings and methodology established by Victory Media. This year’s criteria also incorporated a survey of more than 4,000 actual student veterans. Additional information about methodology is available online.